Karan Johar is back with the spicy and entertaining chat show, Koffee With Karan. With the show in its sixth season, he brought two of the most successful leading ladies from the film industry, Deepika Padukone and Alia Bhatt on the coffee couch. While the ladies refrained from accepting their future plans with their better halves, they covertly accepted their relationships with Ranveer Singh and Ranbir Kapoor when Karan kept asking questions. 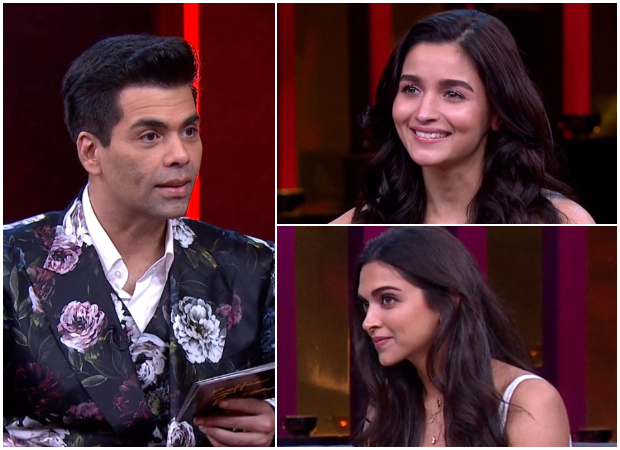 The episode began with Karan Johar making an interesting introduction about the films and how leading ladies have blockbuster films this year. With that being said, he also subtly took a jibe at Kangana Ranaut and the birth of nepotism and how he became the face of it. He said that if now he hears the word nepotism, he gets nepo-spasm in his neck. Both of the ladies talked about their films Padmaavat and Raazi and how it became blockbuster hits at the box office. Moving onto the next conversation when Karan addressed the elephant in the room which was Ranbir Kapoor. Deepika Padukone has had a history with RK since her debut in the film industry whereas Alia Bhatt is dating RK at the moment. He talked about the time when Alia, RK, Ranveer Singh, and Deepika along with Shah Rukh Khan, Aamir Khan were at Karan Johar’s residence for a get-together and there wasn’t any awkwardness between Alia, RK and Deepika. Karan went onto reveal that how Ranveer and Ranbir share a pretty amazing dynamic with each other and at the get-together, they were sitting at the bar and having a very happy and intense conversation. He revealed how appreciative both of them are about each other’s work. Though Alia Bhatt refrained from confirming her relationship with Ranbir Kapoor, she was accepting of the fact throughout the episode they are indeed a couple. Alia also said there is no awkwardness between the three of them. “It is what is. There is nothing to feel bad about and we are all very happy and at peace and very content. Moving on the fun sections when Karan Johar talked about Deepika Padukone and Ranveer Singh’s online PDA and how lovey-dovey they have become on social media in recent months. She even admitted covertly that they have been together for six years since 2011. He also talked about Alia Bhatt broke the internet after Sonam Kapoor’s wedding after posting a picture with Ranbir Kapoor which made it official that they are indeed dating. They even discussed how their moms Neetu Kapoor and Soni Razdan are fond of each other and them being together. The moms had even shared pictures of them having dinner during Ranbir’s birthday celebration. Happy ???? to my Friend Philosopher an Guide ❤️ loads of love and duas ❤️ #lovehim #bestintheworld #wise happy birthday @rimosky ❤️???? There was discussion whether they have been together at a point in presence of Katrina Kaif as well as she has also dated RK. While Alia is friendly with Katrina, she admitted she has always shared a comfort level with Deepika which dates back to a couple of years when they attended the Coldplay concert together. The new segments introduced were ‘That’s the point’ where they had to answer a couple of questions which is like who is more likely to kind of way. Deepika admitted being dumped, later on finally admitted she will be the one who will get married first. Interestingly, this evening Ranveer and Deepika officially announced that they are getting married on November 14th and 15th this year. Alia was very upfront this time about several aspects of her life like friends with benefits relationship, having a rebound soon after the break up and soon on. The rapid-fire round was amazing and the two of them answered questions keeping it pretty nice. Alia won the hamper this time. Another fun game segment was introduced this season is ‘Not without my phone’ where they had to make a call to either a leading lady or actor and tell them what Karan asked them to do. Besides, he asked them to click a selfie and upload, and guess the actors through their shirtless bodies and bios. All in all, the premiere episode of Koffee With Karan season 6 was a mixture of fun, entertainment and a lot of revelations. The second episode will feature Khiladi Akshay Kumar with Khilji Ranveer Singh and from the promo, one can expect it to be a laugh riot.